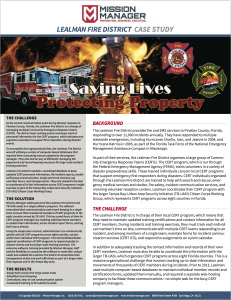 We are pleased to share our latest case study featuring Lealman Fire District and Tampa Bay-Urban Area Security Initiative (TB-UASI) Citizen Corps Working Group. The eight-county team utilizes a single Mission Manager account to streamline coordination of CERT programs for trainings and incident responses. The Lealman Fire District provides fire and EMS services to Pinellas County, Florida, responding to over 11,000 incidents annually. They have responded to multiple statewide emergencies, including Hurricanes Charlie, Ivan, and Jeanne in 2004, and Hurricane Katrina in 2005, as part of the Florida Task Force of the National Emergency Management Assistance Compact in Mississippi. As part of their services, the Lealman Fire District organizes a large group of Community Emergency Response Teams (CERTs). The CERT program, which is run through the Federal Emergency Management Agency (FEMA), trains volunteers in a variety of disaster preparedness skills. These trained individuals can join local CERT programs that support emergency first responders during disasters. CERT individuals organized through the Lealman Fire District are trained to help with search and rescue, emergency medical services and shelter, fire safety, incident communication services, and manning volunteer reception centers. Lealman coordinates their CERT program with the larger Tampa Bay-Urban Area Security Initiative (TB-UASI) Citizen Corps Working Group, which represents CERT Programs across eight counties in Florida. The Lealman Fire District is in charge of their local CERT program, which means that they need to maintain updated training certifications and contact information for all CERT members. 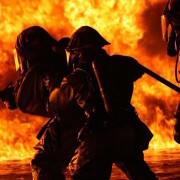 During incidents and training exercises, they must track each individual member’s time on site; communicate with multiple CERT teams responding to an incident, and among members of a single team; maintain forms for incident communication services (CERT ICS); and respond to assignments on a joint calendar. In addition to adequately tracking the contact information and records of their own CERT members, Lealman must also be able to coordinate this information with the larger TB-UASI, which organizes CERT programs across eight Florida counties. This is a massive organizational challenge that involves tracking up-to-date information and movements of thousands of CERT members during incidents. Prior to 2013, Lealman used multiple computer-based databases to maintain individual member records and certification forms, updated them manually, and required a separate web-hosting company to facilitate those communications—no simple task for the busy CERT program managers. These organizational challenges were highlighted in November 2013 when the Lealman Fire District’s CERT Program participated in a Lost Child training exercise in East Lake, Florida. It was a large training event with over 100 participants and the program managers quickly realized that it was impossible to monitor the appropriate use of CERT ICS forms in real-time by all individuals. “As a CERT instructor who taught the use of these forms, I suddenly realized that there had to be a better way,” says Captain K. Larry Thompson, who manages the Emergency Management & Preparedness team at Lealman Fire District. The ability of Mission Manager to effectively meet all of the Lealman Fire District and TB-UASI CERT program management needs was highlighted in June 2016 during the National Homeland Security Conference in Tampa, Florida. As the host agency for the four-day event, TB-UASI used Mission Manager to successfully manage and track more than 100 team assignments and over 750 volunteer hours. SINGLE VS. MULTIPLE TEAM ACCOUNTS FOR COORDINATION ACROSS LARGE URBAN AREAS. An important feature of the Mission Manager software is the flexibility for customers to choose a single or multiple team account. While both methods allow for organization and communication among large groups of people, the single team option can be extremely beneficial for simplifying the coordination of many teams in large urban areas. With multiple team accounts, users must set up an additional administrative account to allow communication between team leaders. However, with a single team account, users have the ability to directly communication with all members, no matter their individual team assignment. Single team accounts still allow managers to assign specific missions to sub-teams, so that smaller groups can maintain their individual tasks within the large team account. Together, the Lealman Fire District and the TB-UASI Citizen Corps Working Group have established a single team account that has streamlined their communication and management across multiple counties and CERT programs. EASY RECORD-KEEPING FOR LARGE GROUPS OF PERSONNEL. Mission Manager makes it simple to keep personnel database records updated. Individual team members’ personal contact information, certifications, and training can be managed directly through the software, and their hours on specific missions can be logged in real time. This means that program managers spend less of their valuable time updating computer databases with information that can quickly become outdated. Mission Manager also allows team members to easily access forms through the software, ensuring that the appropriate ICS reports can be filed quickly. PERSONNEL AND ASSET MANAGEMENT. In addition to managing and coordinating personnel, Mission Manager allows administrators to monitor various resources. There is a separate tab in the software dedicated to inventory of equipment and assets available for use during incidents. Mission Manager even has a mapping feature that allows users to pinpoint equipment and assets on a map to indicate where they are located during a mission. With these records, administrators can quickly compile accurate information about mileage and timekeeping for official reports and grants.